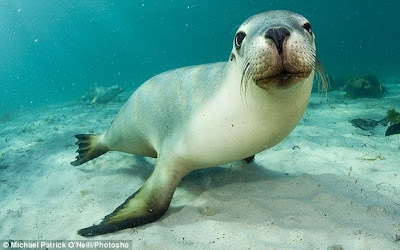 When you are a young and curious sea lion, playing up to an underwater camera comes as second nature. 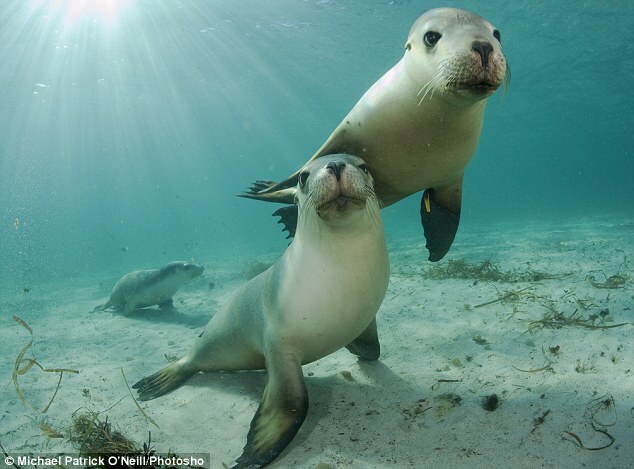 These adorable pups preened and posed for pictures when photographer Michael O'Neill plunged into the sea. At one point, he found himself surrounded by a pod of up to 40 sea lions including a suspicious bull which swam round him before deciding he was a friendly creature. Michael, a professional wildlife cameraman, took the stunning images at South Australia's Hopkins Island near Port Lincoln. He is now planning to publish them in his new book about marine wildlife. The 45-year-old American from Florida, said: 'The pups were mostly playing in the shallows and the adults were basking in the sun, which had been absent for days. 'The minute I jumped into the water from a boat, all the pups raced towards me - they were followed by a big bull who made a few passes to check me out. 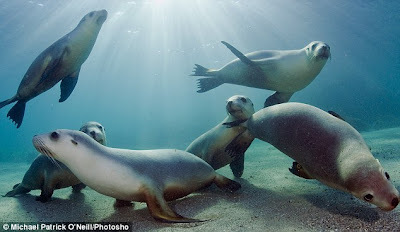 'All of the animals, including the bull, were friendly and were mesmerized by my underwater camera. Group shot: A one stage a pod of 40 sea lions surrounded the photographer after he jumped into the sea. 'The pups played and chased each other, picking up rocks and dropping them and occasionally blowing bubbles. 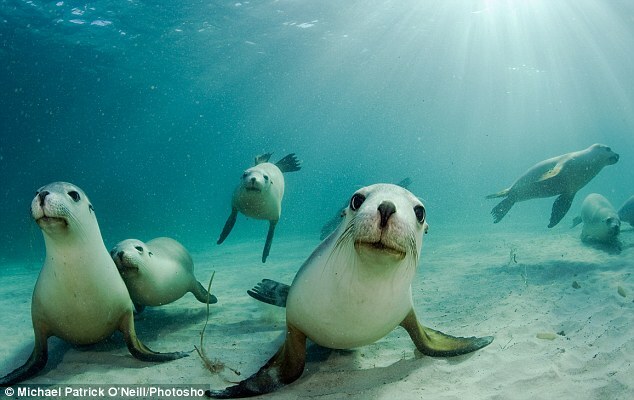 He added: 'I think the Australian sea lion is the most adorable wild animal on the planet, I love how engaged they were while I took the photos. 'I have to say it was the most rewarding experience I've had as a professional photographer. 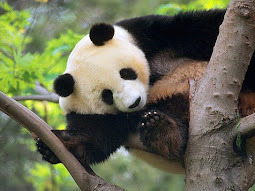 The animals are highly endangered with only 10,000 to 15,000 left despite the fact they have been protected from hunting for the last 40 years. Experts believe a variety of factors are negatively impacting sea lions, including food shortage, entanglement in fishing equipment and high pup mortality. They are also under threat of predation from sharks, human disturbance and even bullying by New Zealand fur seals which are taking over their territory.